I've always been intrigued by the decision to market Yazoo, Vince Clarke's first post-Depeche Mode project, as Yaz in the United States. Who felt so strongly that one of those names would appeal to Americans more than the other, so that a band actually took on two names simultaneously? I'm hard pressed to think of another instance when that has happened. There's a strong through line from Clarke's work on the first Depeche Mode album to Yaz's biggest hits: 'Just can't get enough' and 'Don't go' are kissing cousins, to say the least. But Yaz's two brilliant albums can't be simplified that easily. Alison Moyet definitely pulled her weight in the partnership, not just with a far more soulful voice than Dave Gahan, but with her own talent as a songwriter with blues and jazz influences. For Yaz's second album, You And Me Both, Moyet had written 'Ode to boy' as an uptempo rock song, and reluctantly allowed Clarke to strip away its momentum and pare it back to its icy minimum. A decade later, she would re-record the song in a faster rock arrangement closer to her original vision for her solo album Essex. The Yaz version is much stronger, and this comparison illustrates the core of Yaz's success: the incredible yin/yang relationship between a bank of synthesizers and an earthy vocalist capable of blowing them out of the room. 'Ode to boy' is a fascinating proof of the adage that less is more. Each of the instrumental parts gives the impression that we're not hearing everything; notes and beats might have been stripped away to leave behind only the most essential skeleton. The result is a spider's web on which Moyet's voice rests, at times languidly and at times with the agitation of a woman who senses her prey is nearby. 'When he moves I watch him from behind / He turns and laughter flickers in his eyes / Intent and direct when he speaks / I watch his lips'. This is the story of a love triangle, told from the point of view of the woman who knows she is losing, but who is mired in her obsession all the same. She paints a portrait of the man with clean lines and opaque surfaces that might exist in a Lempicka painting. He is beautiful to the point of femininity, exotic to the point of Americanism, and always posed to the point of cinematography. As intensely as our narrator studies him, he studies another - man or woman, we don't know - and her ache is an echo of his ache. She is transfixed by the sight of him weeping over his own unrealized passion. This song is poised between stasis and motion; it is a kind of tableau vivant in which the characters are incredibly alive to their emotions, but take no consequential action. Our narrator is permanently beside her love in the car, studying his hands. She is permanently in the shadows by the stairs, watching him brood. She is permanently just out of his line of vision, knowing that he sees her but doesn't regard her. It is inaccurate to call this condition hell; there is nothing universal or metaphysical here. The undeniable viscerality is personal and lonely, and we can't escape it, because the narrator is singing to us - we are the object of her man's affection ('I saw him searching into you and ached awhile'.) Whether we were aware of our role in this tableau vivant or not, we find ourselves there, unable to remain neutral. 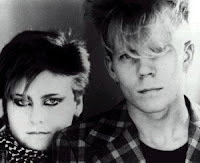 Vince Clarke and Alison Moyet have gone on to other great successes since Yaz, but I would have loved more from them as a team; songs like 'Ode to boy' display a level of artistry that makes it hard to believe they weren't capable of much more.